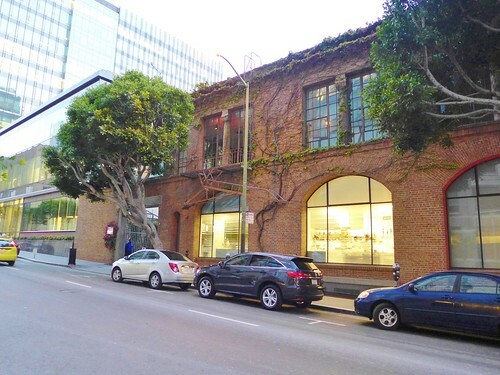 Benu in San Francisco was the last of 3 fine dining stops during our West Coast vacation. Chef Corey Lee is everything but a newbie, having worked 9 years with famed chef Thomas Keller prior to opening his own venue in 2010. 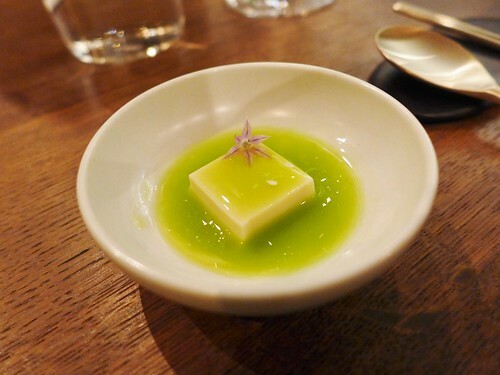 He is known for combining classical French technique with Asian ingredients and flavours as well as for bringing in all the accuracy he had already proved at the French Laundry and Per Se. 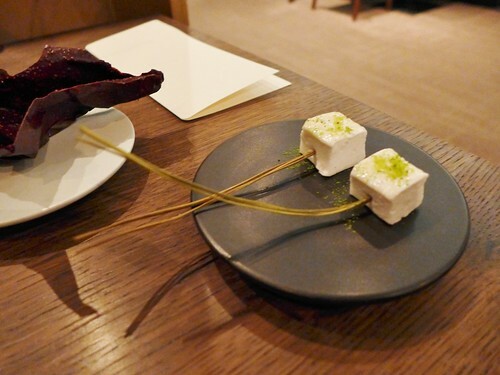 By consequence, Benu has been awarded its third Michelin star in 2014. The general architecture of the place is rather minimalistic. Somehow I didn’t connect much with the atmosphere as there is some sort of formal dimmed lights canteen vibe. It just isn’t as relaxed as Commis where you are very close to the kitchen and really feel like being a personal guest of the team. Also, it is a much different crowd than Commis. It seems like there are many fine dining tourists, attracted by the stars rather than by the food, lots of private celebrations etc… Kind of a weird “dress-up- for-fine-dining-vibe”. But maybe it’s just me. Nothing to complain about the service. It is flawless. The crew is friendly, professional and is not saving on smiles. I only had the impression that we had a different server for each course, which adds a little to the tayloristic feel of the restaurant. Wine service has to be mentioned as well. Master sommelier Yoon Ha has brought together a great list with many gems. He is knowledgeable and, far more important, quickly understands what type of wine you are looking for. A genuine talent that not too many sommeliers have. We opted for the one and only offered menu coming at a hefty 248 USD plus 20% service charge. Food service started right away. 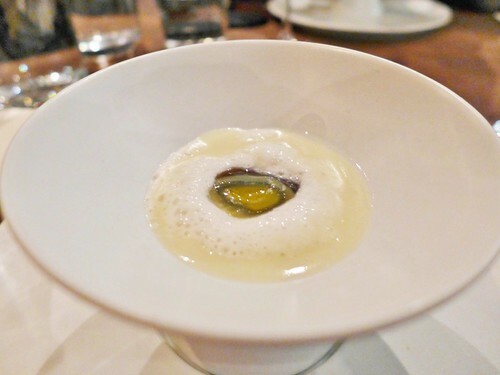 Thousand-year-old quail egg, potage, ginger. The meal starts with a hard boiled quail egg, dropped into a velvety cream. When biting into the egg you can sense the comforting taste of egg yolk which is elevated by the umami of the soy sauce it was marinated in. 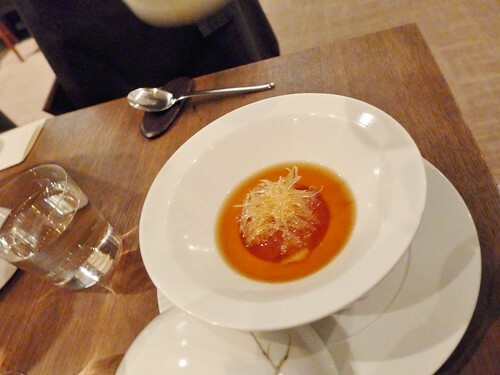 The potage adds a luscious dimension to the already very round impression of the umami. A great first dish that puts one in relaxation mode. Oyster, pork belly, kimchi. Right away comes another tiny bite that shows the accurate and meticulous execution which seems to be typical for Benu. Plus: it’s a very tasty combination. Flower honey with ginseng drizzled on butter. 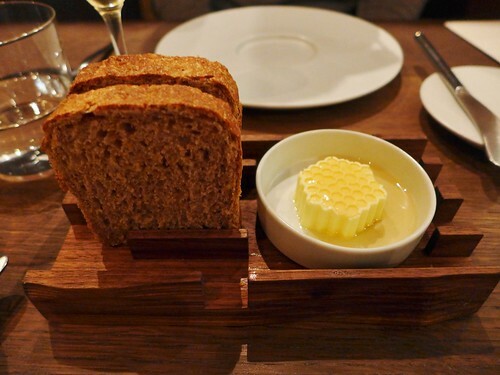 I really like this idea of pouring honey on top of the butter. It’s an eye candy and a working combo. 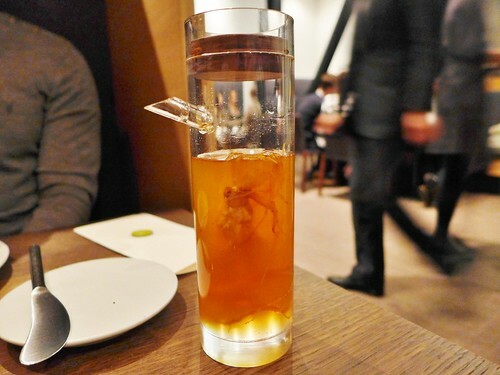 The ginseng adds a hint of spice to the honey. Caramelized anchovy with potato salad. The just big enough portion of rich potato salad, made in a way the Spanish might call it ensalada rusa (without the peas though) is topped by thin slices of crunchy anchovy. 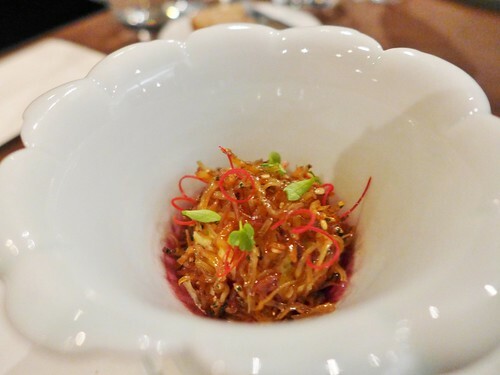 I suppose this dish aims to remind the dried fish (ikan bilis) that are used as a condiment in some of South-East-Asias countries such as Malaysia. Being caramelized rather than dried, they have a less pungent flavor. The idea is to show the contrast between the fresh and creamy potato salad and the flavor-intense anchovies. Some taste spikes come from carefully added chili cuts. A nice one. Whiting, horseradish, cherry blossom. The fish has been powdered in rice flour before being pan-fried and is then served on a stick, maybe reminding a lollipop. The fish has a great bite while being soft and warm inside. Horseradish adds a slight spiciness. 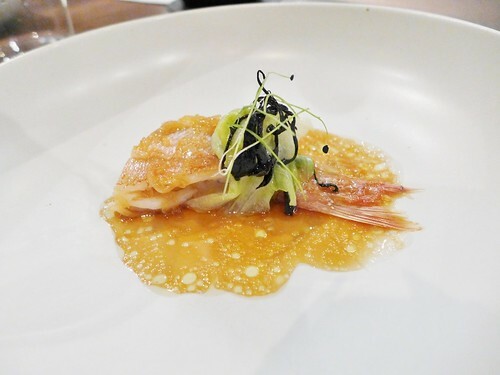 The way it is served adds a lot to the experience as you are more or less forced to eat it in one bite and thus get the idea of the dish, its textures and flavours in its entireness. 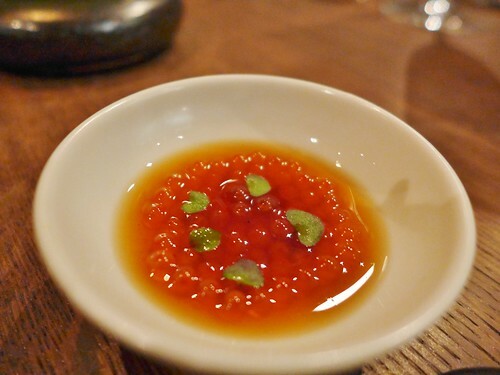 Caviar, winter melon, chicken cream. I like how the solidified chicken cream and the slices of winter melon only complement the flavor of the caviar without overpowering it. 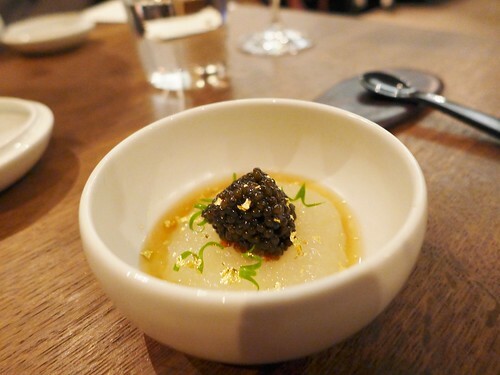 The caviar is put on a pedestal and is able to shine. 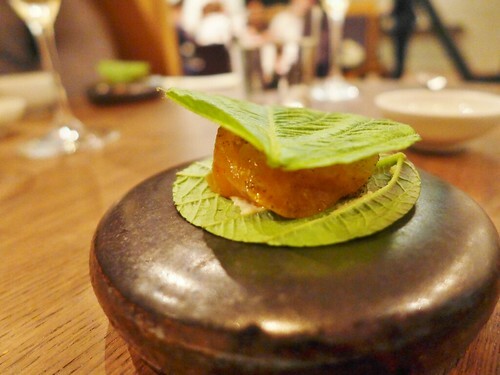 Fluke, sesame leaf, daikon. The fluke is well flavored and still not overpowered by the spiciness of the sesame leaf (actually perilla leaf, commonly used in Korea). Thought-through and tasty. 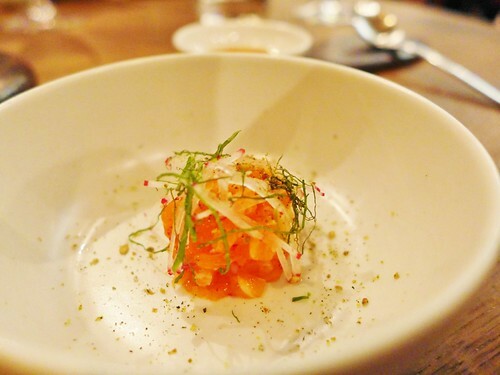 Sea trout with roe, radish, perilla. Perilla here refers to the oil of the sesame leaf plant. 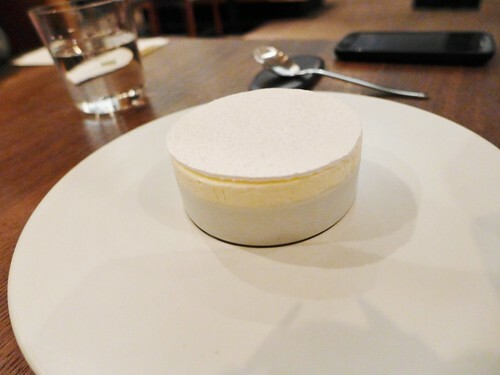 The dish is separated in 2 servings in order to show a wider range of textures. But I have to admit, this didn’t excite me too much. Asparagus and sesame. This dish is also coming in 2 separate plates. One containing asparagus with sesame, the other one sesame with asparagus. The latter is tofu with sesame flavor in an asparagus dressing, the first one green asparagus sprinkled with sesame crunch. This is not only an interesting and playful dish, it also tastes good. It transports balance and harmony. I enjoyed this one much more than the previous 2-dish-serving. 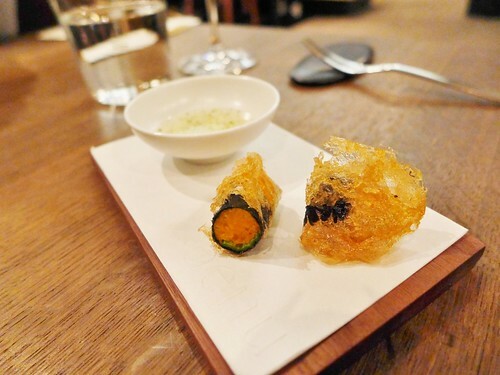 Sea urchin, Okra, nori. The sea urchin is served as a roll. It is wrapped with nori and then fried. Not sure exactly how okra is used here, maybe as a part of the batter? This is one of the weaker dishes in my opinion. Although it certainly tastes good, the sea urchin seems a little dry compared to the raw uni I know from sushi restaurants. 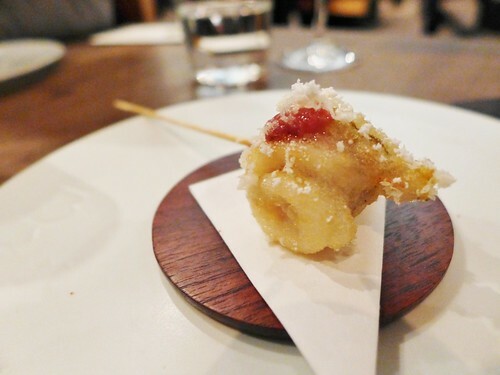 Foie gras xia long bao. 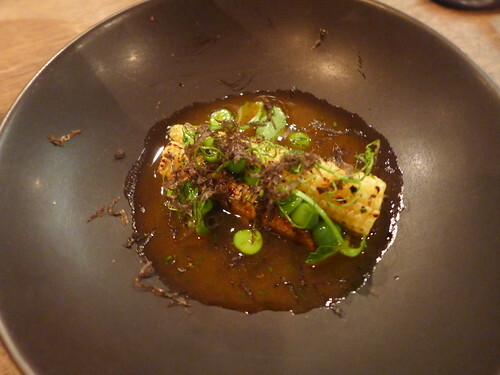 This is one of Corey Lee’s signature dishes and it is indeed wonderful. 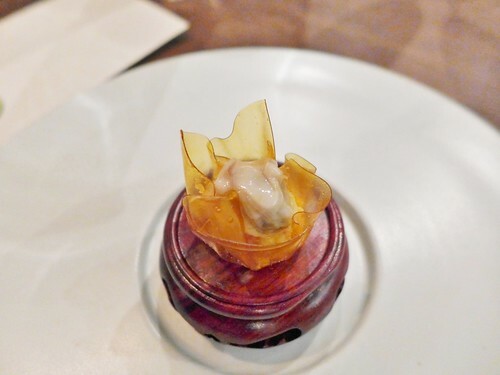 What a great idea to add some foie gras to the most soulful dumpling of Asian cuisine. It is served with the traditional vinegar sauce. Two genius bites! 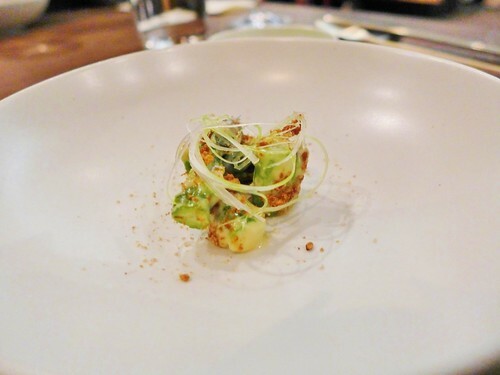 frog leg, mountain yam, celtuce. This is Benu’s take on ginger frog I assume. The frog meat is completely boneless and cooked to perfection. With a slight bite, but foremost tender. Texture is somehow in between perfectly cooked squid and chicken. The thin cuts of ginger add just the right amount of spicy warmth. Great! Whole baby sea bream, iceberg, black trumpet mushroom, aged tangerine peel. Now a really juicy, flavorful fish with some subtle, tart fruit flavors coming from the tangerine. Very good. Baby corn, peas, black truffle, roasted hen jus. This one didn’t excite me that much although there was plenty of truffle flavor. There’s something very bold about corn and truffle put together which is actually enjoyable, but I don’t see how it fits in to this sequence of dishes. 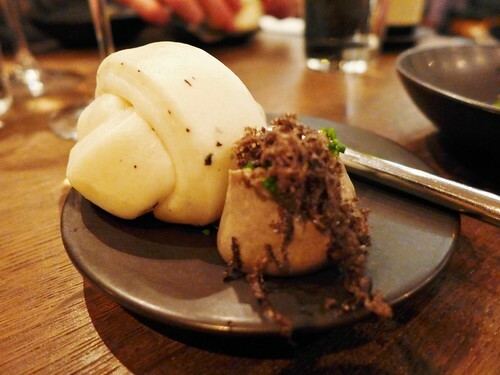 Maybe just for the sake of having truffles in a fine dining menu? 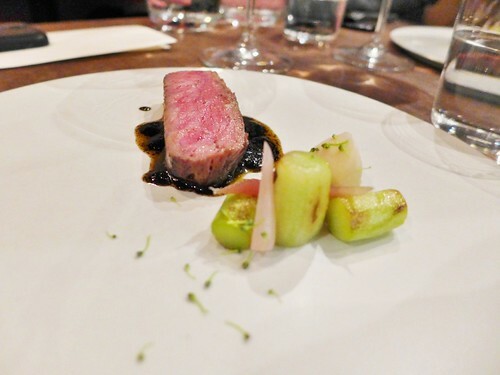 Beef rib, eggplant, broccoli, ramp, charred scallion. A nice piece of beef, perfectly cooked, but a pretty standard dish. Enjoyable, but lacking the expected originality. 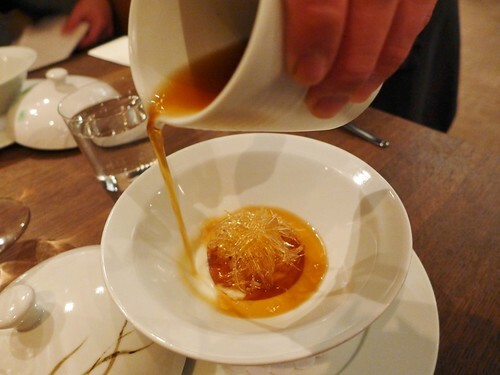 “shark fin soup”, dungeness crab, jinhua ham custard. 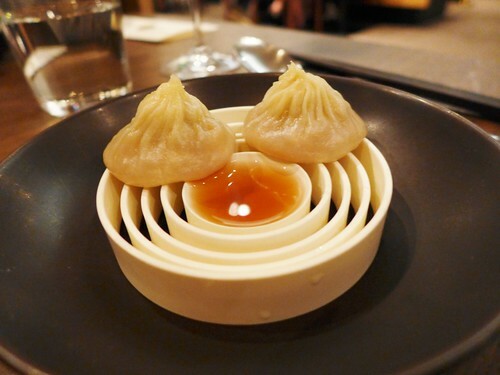 The fake shark fin soup is probably equally as famous as Corey Lee’s foie gras xia long bao. 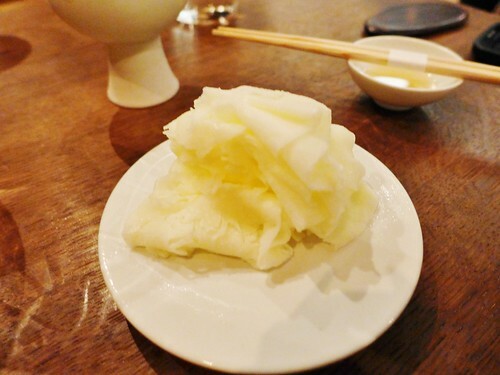 The shark fin meat is simulated by thickeners like agar agar that are being solidified in a calcium bath (See an explanation here). It’s all about the gelatinous texture which is typical for shark fin soup. The flavor comes from the broth which has a certain ham flavor. This probably has something to do with the ham custard at the bottom of the plate. A good dish to end the savory part of the meal. Shaved milk and honey. Shavings of frozen milk drizzled with honey. A very refreshing palate cleanser. coconut, almond, strawberry. I forgot to take notes from here on. But I don’t remind this as being a groundbreaking dessert. 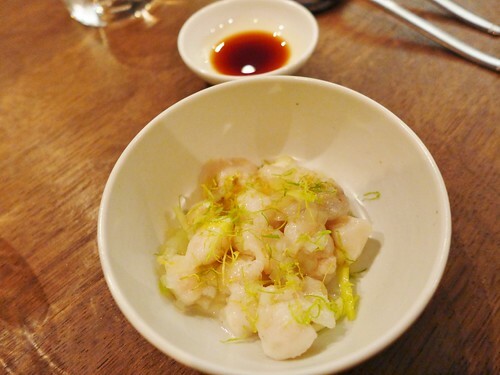 There’s a lot of thinking that has gone into Benu’s food and it is fascinating to see how Asian classics have been reinvented with a lot of refinement. I enjoyed most of the dishes and definitely have to agree with the 3 star rating. In particular the accurate and flawless execution is worth the highest of accolades. Regarding creativity I have to say that while there were some extremely ingenious plates, there also were a couple of dishes that seemed a bit too standard, made to fit in to a fine dining menu. 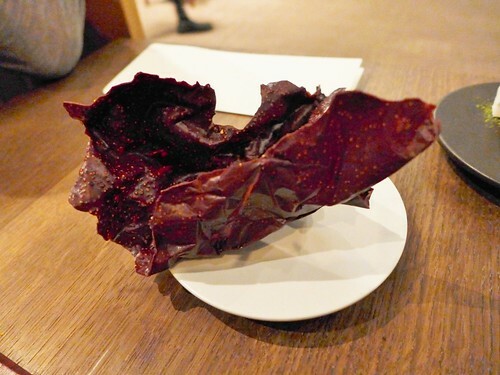 Who needs the 1000st beef rib in a starred restaurants while there could be much more original meat dishes (I have to think of Sang Hoon Degeimbre’s takes on pigeon and Wagyu, find the pics in this posting)? What I somehow didn’t like that much was the vibe of the restaurant. Nothing to do with the service which was just what you would expect from a 3 star restaurant. It just wasn’t laid back enough to allow full enjoyment. But this might be a personal matter.